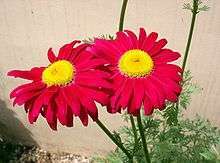 Pyrethrum was a genus of several Old World plants now classified as Chrysanthemum or Tanacetum (e.g., C. coccineum) which are cultivated as ornamentals for their showy flower heads. Pyrethrum continues to be used as a common name for plants formerly included in the genus Pyrethrum. Pyrethrum is also the name of a natural insecticide made from the dried flower heads of Chrysanthemum cinerariifolium and Chrysanthemum coccineum. Some members of the Chrysanthemum genus, such as the following two, are placed in the Tanacetum genus instead by some botanists. Both genera are members of the daisy (or aster) family, Asteraceae. They are all perennial plants with a daisy-like appearance and white petals. T. cinerariifolium is called the Dalmatian chrysanthemum, denoting its origin in that region of the Balkans (Dalmatia). It looks more like the common daisy than other pyrethrums do. Its flowers, typically white with yellow centers, grow from numerous fairly rigid stems. Plants have blue-green leaves and grow to 45 to 100 cm in height. The plant is economically important as a natural source of insecticide. The flowers are pulverized and the active components, called pyrethrins, contained in the seed cases, are extracted and sold in the form of an oleoresin. This is applied as a suspension in water or oil, or as a powder. Pyrethrins attack the nervous systems of all insects, and inhibit female mosquitoes from biting. When present in amounts less than those fatal to insects, they still appear to have an insect repellent effect. They are harmful to fish, but are far less toxic to mammals and birds than many synthetic insecticides and are not persistent, being biodegradable and also decompose easily on exposure to light. They are considered to be amongst the safest insecticides for use around food. Kenya produced 90% (over 6,000 tonnes) of the world's pyrethrum in 1998, called py for short. Production in Tanzania and Ecuador is also significant. Currently the world's major producer is Tasmania, Australia. C. coccineum, the Persian chrysanthemum, is a perennial plant native to Caucasus and looks somewhat like a daisy. It produces large white, pink or red flowers. The leaves resemble those of ferns, and the plant grows to between 30 and 60 cm in height. The flowering period is June to July in temperate climates (Northern Hemisphere). C. coccineum also contains insecticidal pyrethrum substances, but it is a poor source compared to C. cinerariifolium. Other species, such as C. balsamita and C. marshalli, also contain insecticidal substances, but are less effective than the two species mentioned above. Pyrethrum has been used for centuries as an insecticide, and as a lice remedy in the Middle East (Persian powder, also known as "Persian pellitory"). It was sold worldwide under the brand Zacherlin by Austrian industrialist J. Zacherl. It is one of the most commonly used non-synthetic insecticides allowed in certified organic agriculture. The flowers should be dried and then crushed and mixed with water. Rat and rabbit LD50 levels for pyrethrum are high (safe), with doses in some cases of about 1% of the animal's body weight required to cause significant mortality similar to levels in synthetic pyrethroids. 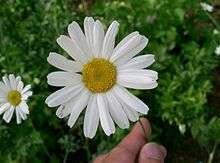 Nevertheless, pyrethrum should be handled with the same caution as synthetic insecticides. People can be exposed to pyrethrum as a mixture of cinerin, jasmolin, and pyrethrin in the workplace by breathing it in, getting it in the eyes or on the skin, or swallowing it. The Occupational Safety and Health Administration (OSHA) has set the legal limit (Permissible exposure limit) for pyrethrum exposure in the workplace as 5 mg/m3 over an 8-hour workday. The National Institute for Occupational Safety and Health (NIOSH) has set a Recommended exposure limit (REL) of 5 mg/m3 over an 8-hour workday. At levels of 5000 mg/m3, pyrethrum is immediately dangerous to life and health. People exposed to pyrethrum may experience symptoms including pruritus (itching), dermatitis, papules, erythema (red skin), rhinorrhea (runny nose), sneezing, and asthma. ↑ Some Pesticides Permitted in Organic Gardening, by Laura Pickett Pottorff, Colorado State University Cooperative Extension, January 5, 2010. ↑ "CDC - NIOSH Pocket Guide to Chemical Hazards - Pyrethrum". www.cdc.gov. Retrieved 2015-10-23. ↑ Riotte, Louise (1998). Carrots Love Tomatoes. North Adams, MA: Storey Publishing, LLC. p. 72. ISBN 978-1-58017-027-7. "International Center for Pyrethrum Research"